Inbound marketing is moving from an emerging discipline to a core marketing strategy for many business. Inbound philosophies are now at the forefront of how websites are designed and succeed online. The advent of content as the primary ranking criteria in Google’s algorithm is just one of the reasons why content marketing and earning business with your content is so valuable in today’s marketer’s toolbox. Easily measurable and highly accountable marketing techniques. Strong ability to build and strengthen customer relationships. Great, cost-effective exposure for brands and thought leadership. As you’ve no doubt learned by now, we don’t recommend implementing any kind of marketing program until you’ve done some analysis of your past endeavors and their success, and developed a strategy for moving forward. We typically do this through our Discovery process. Develop content offers relevant to your marketing personas and mapped to the stages of the purchase process: awareness, consideration, decision. What do people need or want to know when they’re just identifying their problem or challenge? What do they need to learn before they can make a smart decision? Start answering those questions, along with the standard questions people ask you before they become your customer. Then, build landing pages for those content offers. 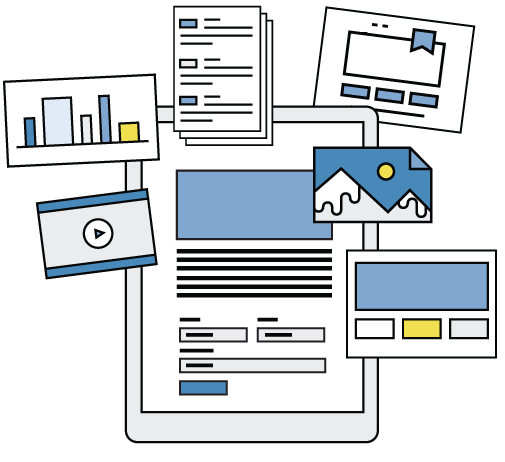 A landing page typically includes a form and exists principally to convert website visitors into leads by capturing some amount of personal information in exchange for something – either a piece of content, or offer of a consultation, demo or assessment. Also consider how committed people will be to getting this information from you and then create your “gate” or form accordingly. For example, top of the funnel or awareness offers should be low-commitment offers such as e-books or educational content and are targeted to buyers just identifying their challenge. These items may only require a name and email to access or download. More in-depth content offers may warrant requiring additional pieces of information, like title, company and other demographics that would help you qualify the lead. Send an email to a segment of your database who fits the persona, might be interested in your offer, and who you want to further qualify via reconversions on a new content offer. Write a blog post. Blog posts can introduce the content offer to your readers and link them to the landing page via a call-to-action in or at the end of the post. Create Calls-to-Action. Calls-to-action are like little ads you create and place throughout your website or blog to entice website visitors to take action. Place them in blog posts or other relevant locations on your site which might see good traffic. Promote on social media. Present your offer on your social media channels to direct followers or searchers to your landing page to redeem the content offer. Make it easy for others to share your offer by including sharing features on your landing page and blog post to allow others to promote your content for you. Paid Media Campaigns. One of the quickest and most effective ways to get qualified traffic outside your normal network to your offer is via paid media. Paid campaigns can provide immediate reach to users who are searching on questions that your offer solves. And, they allow you to learn what keywords and questions people are searching for, so you can optimize your content and offer to better the performance long-term. Once someone has converted from a visitor to a lead by filling out a form on your website, enroll them in a workflow, which uses follow-up emails and other content offers to draw them through the purchase process and facilitate additional conversations and interactions. Whether you’re executing a discrete campaign or an ongoing strategy, build in milestones to analyze your results. Measuring progress allows you to adapt and improve along the way. It also lets you identify successful campaigns that you can use to model new campaigns. Whether it’s via inbound or outbound marketing efforts, lead generation is the first step to earning more customers and more business for your organization. If you’re planning your content marketing efforts correctly and obtaining leads from different channels, you’ll want to know why — and how — to score them properly. Once your leads are in the system and scored, the next step is to nurture them along their journey from prospect to customer. Everything you’ve put in place up to this point will facilitate success here. How organized is your inbound marketing campaign? 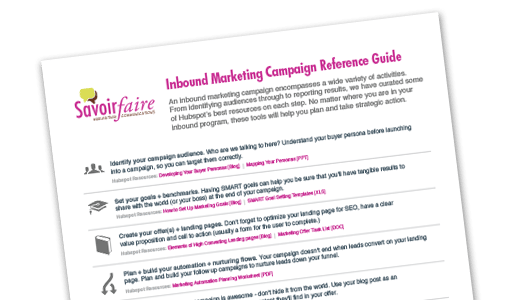 Use our campaign reference guide to organize your program.